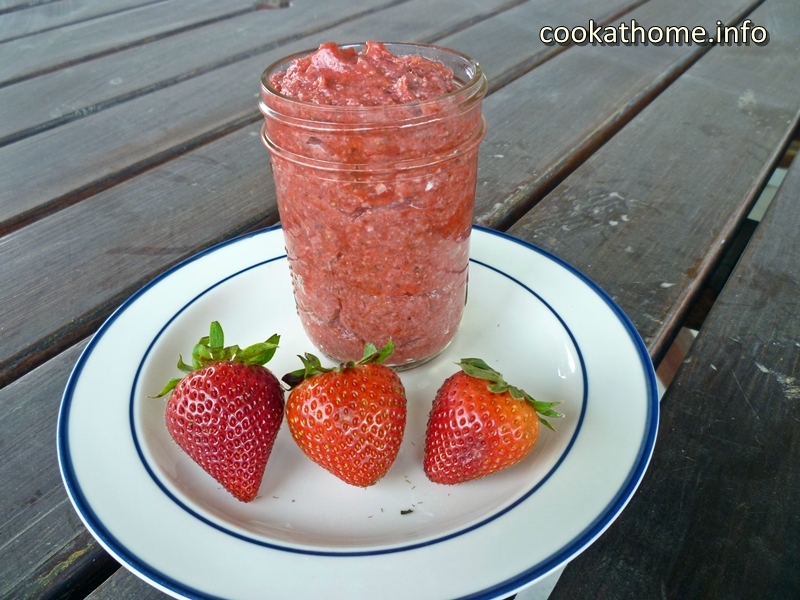 Make strawberry coconut jam at home – and enjoy this healthy Paleo friendly spread, sweetened only with one date! One thing I love about being on social media is the challenges I give myself when looking at all the awesome food photos that other bloggers post. And I kept seeing photos of homemade jam. And I thought to myself … I can do that! Have you ever noticed the ingredients list on most of the commercial jams? Often the first ingredient is sugar. Or, in the US, high fructose corn syrup. And I’m on a quest to limit both of these things. So I thought to myself … what if I do what everyone else on social media seems to be able to do with ease, and make my own jam, with only natural sweeteners? And thus this recipe was born. I’ve made this strawberry coconut jam a number of times, both with and without additional sweeteners – sometimes the strawberries I’ve bought have been sweet enough. Other times I’ve added in maple syrup, or just one Medjool date. Feel free to add or subtract your own sweetener – I’m just giving you the middle-ground sweetness recipe! And I add coconut too – just to add some extra texture in the jam because … well just because I love it! Again, feel free to leave this out and just use strawberries, and chia seeds. And how would you use it? Well, either as the traditional way of spreading on bread (gluten-free if needed). Or in granola. You could also go all out and make this yummy strawberry swirl cashew cream pie, using this as the swirl. Or you just eat it with a spoon! This strawberry coconut jam keeps for ages in the refrigerator – and I would highly recommend chilling it before you first use it. Because it just doesn’t taste quite right when it’s warm. Or maybe that’s just me? Anyway, give it a go and let me know what you think! Process the strawberries and date (if needed) together in a high speed blender or food processor until smooth and no chunks of date remain. Pour into container, seal and chill in refrigerator for at least 1 hour prior to serving.